A: I chose to work as a veterinary technician to expand my knowledge and skills in the field of veterinary medicine, as they will be incredibly helpful as I pursue a career as a veterinarian! A: I am currently studying pre-veterinary medicine and animal biosciences at the University of Delaware! I have worked in veterinary offices previously in my hometown in Maryland. A: LVC seemed like the perfect fit for a student seeking hands-on veterinary experience and education. 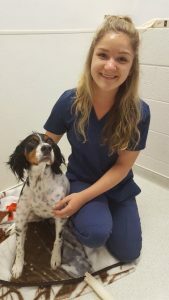 They are well known for the high quality of veterinary care they provide and are incredibly open and willing to work with students like myself. A: I love the friendly and open staff, doctors, and clients! It is so refreshing to work in such an upbeat environment. A: Everything! I am incredibly interested in the field of veterinary medicine and would love to use my time here to expand my knowledge and understanding of anything and everything pertaining to this field. A: I have a 2 year old golden retriever/ german shorthaired pointer mix named Bentley. A: I am currently involved in several clubs at UD, including Animal Science Club and Canine Companions for Independence. I am also on the Executive Board for Sigma Alpha, a professional agriculture sorority.